Early this year we presented a prize to our noble winner and we hope the next winner will be up soon. Zealmat is a portal for every young mind in the society at large, and giving you good tutorials, encouragement and support and we hope to serve you better. 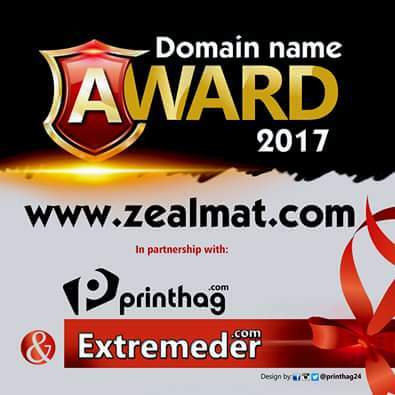 2) Share this link to your twitter account and Facebook timeline using the hash tag #zealmatAward2017 then send the link to us. 3) Be An active visitor and subscribe to our newsletter using the box below. The winner will be issued a certificate and a cash of N3000 or a .com domain name. With free 100 SMS units for the winner and free one week advert space on proudlyblog. This is the link of my twitter share!!! My names is Adedunni Jeremiah.